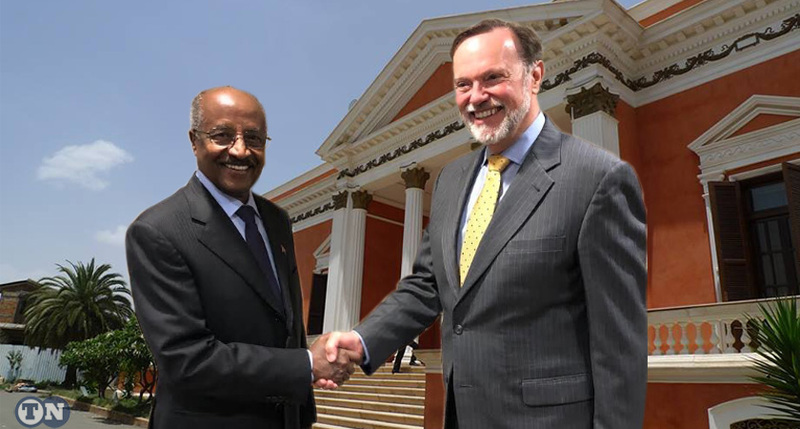 “We would like to have the same type of positive relations with Eritrea as we do with Ethiopia” – Tibor Peter Nagy, Assistant Secretary of State for African Affair. The UN Security Council sanctioned Eritrea in 2009 for [allegedely] supporting Al-Shabaab militants in Somalia but lifted the restrictions following the July signing of a peace deal that ended 20 years of conflict with neighbouring Ethiopia. However, the US ultimately backed the Security Council resolution lifting sanctions, a shift diplomats attributed to national security adviser John Bolton, who dealt with the Eritrea-Ethiopia conflict when he served as UN ambassador. Once a province of Ethiopia [1961 – 1991], Eritrea [won and] voted for independence in 1993 and five years later fought a two-year [border] war against its southern neighbour that ground into a stalemate. The two countries normalized relations following Ethiopian Prime Minister Abiy Ahmed’s June announcement that his government would honour a UN ruling ceding disputed border territory to Eritrea. 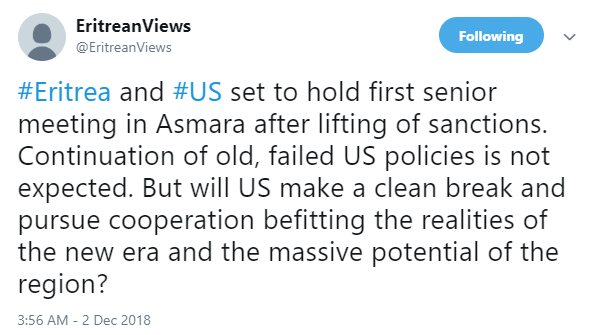 The countries’ rapprochement raised hopes Asmara would release jailed dissidents and end much-criticized policies such as an indefinite national service scheme that forces people into government jobs at low pay.